Earlier this month we had the honor of participating in a community workshop with the Los Angeles Neighborhood Land Trust for renovations at Estrella Park in Los Angeles. We truly value opportunity of engaging community in coming together to collaborate in projects that affect them. A scope of work was previously introduced based on what we believed was needed at the park. However, it is vital to get community input as to what will work and what will not work for them. Ultimately, this park is for them. After careful analyzes of what the community liked and disliked we are excited to say we will be moving forward with the renovations. Below are pictures of our project manager Gustavo Elias and David from the Los Angeles Neighborhood Land Trust. Our friends at Semillas Wellness hosted an art show at our location this past Friday and Saturday. It was an exciting opportunity to learn about local artist. This along with an open mic provided an opportunity for the local community to come together through art. It is with great pleasure that we share the city of Lynwood newsletter which highlights our work with the Lynwood Youth Advocacy Group. It has been a pleasure to work with such motivated youth. If anyone would like to get involved as well, please reach out to us! Please come by this Saturday July 14th to our office at 3837 Tweedy Blvd South Gate Ca as we will be having delicious food and drinks. We are currently working with our friends of Semillas Wellness in fundraising for the purchase of ten plots at the community garden in Lynwood. If we achieve our goal we are planning on having educational courses on food deserts, landscape techniques and even food give-aways to those in need. This is a very important issue as Lynwood and South Gate are currently in food deserts with lack of access to fresh fruits and vegetables. This will be a great opportunity to bring much needed fruits and vegetables to these communities. We will be moving to our neighboring city of South Gate to a much more bigger location. Our new address will be 3837 Tweedy Blvd South Gate California. We are excited to be moving to a bigger location that will provide more opportunities for engagement. As you can see in the picture above, we are still in the process of moving stuff over. However, we couldn't keep ourselves from sharing this exciting news with all of you! In the meantime, please consider donating to our bookshelf. We will be lending out the books that are donated to our local community and anyone who is interested. This is a great opportunity to share our field through books! 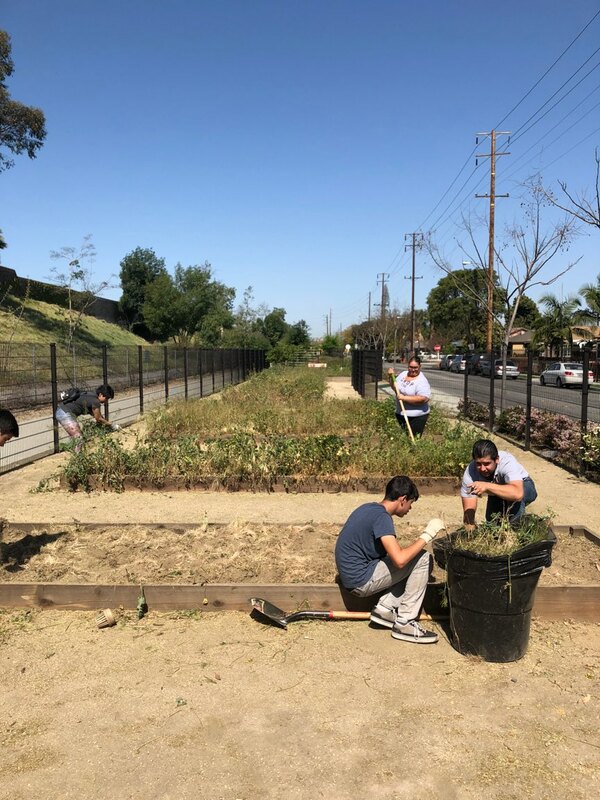 This past Saturday April 14th we had the opportunity of working with the Lynwood Parks and Recreation department in cleaning up our local linear park and community garden. We also had the opportunity to plant community garden plots with fruits, vegetables and herbs. This was a great opportunity to provide clean spaces for the community as well as engage and teach local youth about landscape techniques and practices. We had the honor of hosting a community workshop recently. We look forward to many more productive events! I was lucky to participate in a career fair and given the opportunity to talk about the landscape profession to the youth recently. This was a great opportunity to introduce the many benefits of the landscape profession to young kids who may be struggling in school or may be seeking an opportunity to showcase their talent and enthusiasm but do not have the via to do so. This was also a great opportunity to engage the youth to live healthier lifestyles and educate them on food deserts and food insecurities and how one can use the landscape field as a gateway and tool to solve community issues. Happy New Year to you all, we wish you the best in this coming year and look forward to 2017. Being that we are located in Los Angeles, today I will talk about urban cities and the role us design professionals can play in making urban cities a better place. For all of you reading this who may be living in rural areas, do not worry, as one of my next blogs will be written on the rural landscape. It is in our hands as design professionals to help urban communities through what we know best, landscape designs that provides opportunities for people. A major problem urban communities have is the lack of accessibility to healthy food options. Urban communities are located in food desserts, where one must drive miles and miles to have access to fresh foods. We as landscape designers must designate in our designs land where the community can grow their own food. Community gardens are a huge success nationwide but yet are not always implemented when needed in our designs. Community gardens create the opportunity for people in the community to connect, learn a trade and heal. Community gardens provide the opportunity for those with physical and mental sicknesses to heal in a holistically way. It also provides the opportunity for those who are not able to drive many miles to buy fresh organic food the opportunity to have access to healthy foods. Many people wish to have access to healthy food but because that is not an option they are forced to eat unhealthy foods. We as landscape designers have to create employment opportunities within our designs. Whether it is creating employment for years to come in what we design or providing the community the opportunity to work in the implementation process of the design. This provides the opportunity for people in urban communities to learn a trade and build a connection with the project. This also allows the opportunity for the community to add their personal touch to the project as well. It is in our hands to provide the opportunity for communities to create a healthier urban community that will benefit themselves. We must trust and work closely to the community of which we are working in and provide them the opportunity to add their own personal touch. We must design sustainable affordable housing, community gardens and other features that lead to happiness and well being in urban communities. I wish you all a prosperous 2017 and hope you all are having a great week.